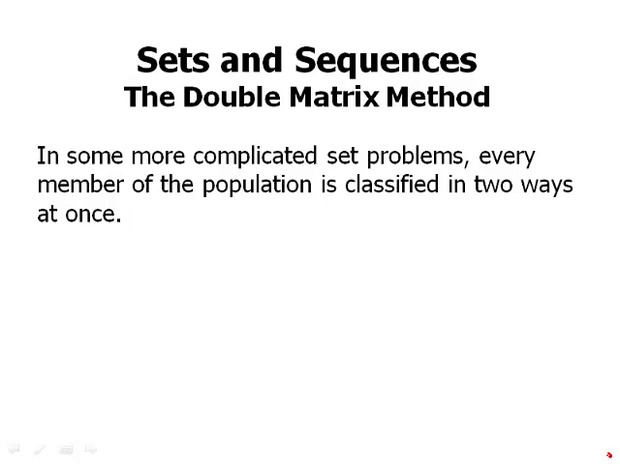 The Double Matrix Method. In some more complicated set problems, every member of the population is classified in two ways at once. For example, if we were to look at employees at a particular company, we might group employees by gender, either male or female. And education, and here we're just gonna consider two categories. A college degree only, that is, a Bachelor's degree versus an advanced degree. In that example, every single employee would be classified by gender. Also, every single employee would be classified by education level. So everyone's going to be categorized in two ways at once. The information the problem could give might be how many females and of course that would include both education levels. So there's a lot of information here. So let's start out by looking at this question: In a company of 300 employees, 120 are females. A total of 200 employees have advanced degrees and the rest have college degree only. If 80 employees are males with college degrees only, how many are females with advanced degrees? Well, we're not gonna solve this just yet. Here's what I'm gonna say. Notice that some pieces of information lead relatively quickly to other pieces of information. We know there are 300 employees. 120 are females that means the other 180 have to be males. Similarly, if 200 of the employees have advanced degrees. Well then there must be 100 with college degrees only. So, there's certainly ways that some pieces of information lead to others but we need a way to organize all of this information. An excellent way to organize the information in such a problem is known as the Double Matrix Method. This makes use of a matrix, that is, a rectangular array of boxes, each with a number in it. The columns will represent the categories of one variable, and the rows will represent the categories of the other variable. For this problem let's say that gender will be the columns and education level will be the rows. So, here's the tricky part. There are two genders so we will need three columns. One for female, one for male, and one for the totals, male plus females. There are also two educational levels, so we'll need three rows. One for college only, one for advanced degree only, and one for the totals. So the full system, here it is in symbolic form. So G would be the total number of females, H would be the total number of males. In both those cases, we're just lumping everyone of all the degree levels together. Finally T, that bottom righthand box, is the grand total. That's everyone in the whole company, everyone in the collection. And we can get that either by adding across the bottom row, G plus H equals T.
Or we can add down the right column, E plus F equals T. And so, everything should check. All those sums should be equal. So, now try this question again and then we'll solve it with the double matrix method. You can pause the video here. Okay. So there are four numbers given in the question, and I'm gonna write those in our double matrix. So now as we said above, if there are 120 females, there have to be 180 males so that they add up to 300. There must be 100 females with advanced degrees. That's the answer for which we're looking. Let's just check and make sure that this works. We look down the female column, blank plus 100 should equal 120 so that would mean that this equals 20. Then we add across that top row 20 plus 80 equals 100. Everything checks and so indeed there are 100 females with advanced degrees in this company. If one of the variables has three categories that would require four, or four rows or four columns. Because again, we'd need one for each category as well as one for the total. Of course, the information can be given in simple numerical form as we had in the last problem or in some other form, ratios or algebraic. Something like that. There's many different ways that the numbers can be given. Here's a relatively challenging problem. So pause the video, and then we'll talk about this. We have grade level is one of our categories so it has one of our variables, it has three categories. And we have the totals in each of those three categories. Then we have three cities. That's gonna be the other variable. What city is the student from? And we have three categories there. And here we're given percent information. 60 from, 60% from A, 30% from B, the rest from C. And then we have some other pieces of information. All the students from C are freshmen. Half the students from B are upperclassmen, and the rest are split evenly between the other two grades. How many sophomores are from A? So for this we need an enormous double matrix table, and here I've written in the totals for freshmen, sophomore, and upperclassmen. And I just went ahead and summed across that bottom row to get 400. So, that's the total number of people at the school. So now we can start thinking about the percentage information. 60% of the students are from A. We need 60% of 400. Well, 10% of 400 is 40. So multiply that by six and that's 240. And that's 60%. Then 30% are from B. So there are 40 students from C. All 40 of them are freshmen. And then we can just put zeroes in these columns. So that enormously simplifies everything. Now we're told that half the students from B are upperclassmen. So half of 120 is 60. Half of them are upperclassmen. And the other 60 are split evenly, so 30 and 30. So now we want sophomores from A. We'll look down the sophomore column. We have blank plus 30 plus 0 equal 100. Clearly this number has to be 70, and that's our answer.